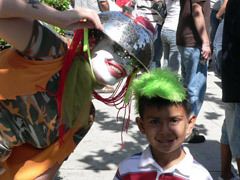 General Giggles is part of of the Boredom Patrol of the Clandestine Insurgent Rebel Clown Army. We are Clandestine because the sneaking game is our favorite, especially when everyone knows you're coming. We are Insurgent because we spend our days mocking racist vigilante paramilitaries. (aka the Minuteklan) Our only weapons are feather dusters, baguettes and bubbles. We are Rebel because our solidarity knows no borders and because we want to eat borders like the cookie monster until it crumbles in our laps. 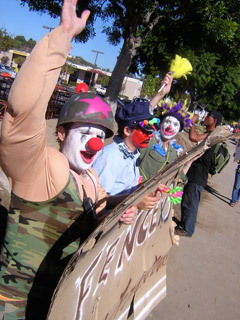 We are Clowns because what else can one be on the edge of the nation state. Because nothing undermines the border like holding it up to ridicule. Because since the conquest tricksters have embraced the contradictions of inclusion and exclusion, creating coherence through confusion. Because in the face of facism we are fools, both fearsome and innocent, wise and stupid, entertainers and dissenters, healers and laughing stocks, scapegoats and subversives. We are an Army because in the borderlands we are in permanent war � a war of money against life, north against south, profit against dignity, to stop the right of mobility, of neo-Colonialism against culture and tradition. We are C.I.R.C.A. because we live in the borderlands, always in between, on the edge of the nation state, mischevously ambiguous.